Pâté makes for a nice autumnal spread, doesn’t it? Root vegetables to serve it with (instead of the usual bread), herbs, and mushrooms combine for a festive seasonal look. In addition to being pretty, pâté keeps well and wins convenience points: just slice it when you get home from work and voilà! You’ve pretty much got a chic, extremely nutrient-dense version of meatloaf. Lastly, this is a one-pot meal (well, it’s a one pot and a food processor meal), which I love. It’s so relaxing to add the ingredients in intervals with only a bit of stirring every once in a while to keep the bacon from spitting and the onions from burning. 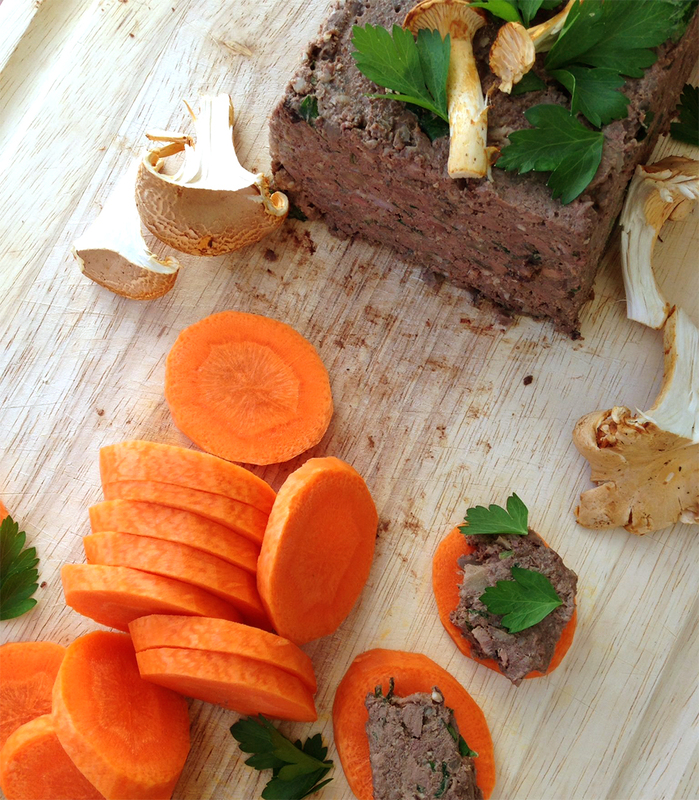 Coarsely ground and rustic, this Primal pâté features chicken liver, bacon, mushrooms and herbs. Roughly chop the bacon and fry in a large skillet over medium heat until lightly browned. Coarsely chop the onion and garlic, add to the bacon and cook until the onions are softened and lightly browned, about 10 minutes. Chop the mushrooms and add to the bacon mixture, then add the chicken livers. Cook, stirring occasionally, until they’re cooked through but still slightly pink inside, 8 to 10 minutes. As the livers cook, add the butter, a few tablespoons at a time. Remove the skillet from the heat and season the livers with the salt and pepper. Allow the mixture to cool enough to handle. Transfer the mixture to a food processor and pulse 3 to 4 times, just until a coarse paste is achieved. Stir in the parsley. Line a loaf pan with plastic wrap and scrape the chicken liver mixture into the pan. Cover with plastic wrap and refrigerate until the butter solidifies, at least several hours and preferably overnight. 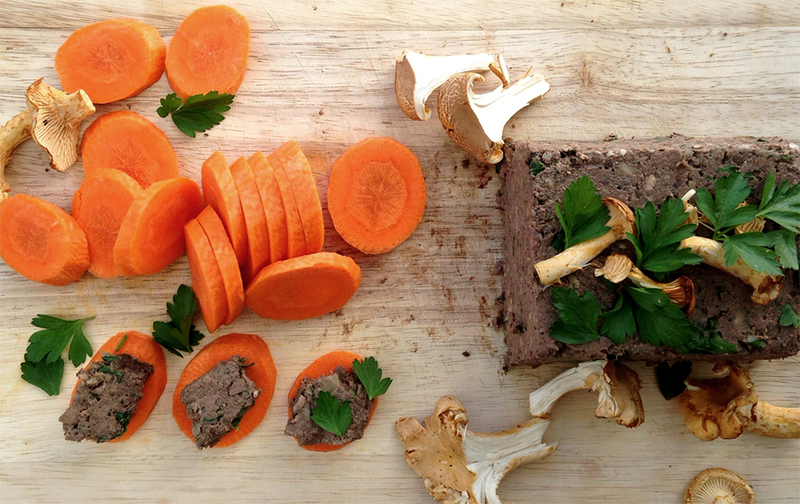 Turn the pâté out onto a serving plate, distribute the parsley leaves and mushrooms over the top, and serve chilled with carrot slices. Feel free to experiment with other herbs to flavor this meatloaf. I intend to include thyme the next time I throw this together! Can you do this with other kinds of liver? Grass fed beef or pork for instance? I think it might work, but those taste far more strongly of liver. At least, in my opinion. 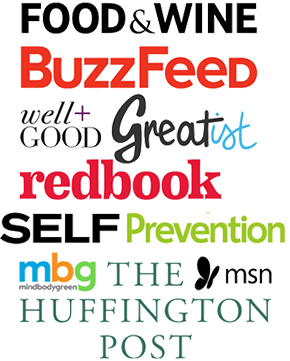 If you prefer those, go for it! This is the first time I’ve made pate…and it was the BEST!!!! It was SO good my fussy 80 year old Italian mother ate it…..she loved it with celery the best tonight…she’s trying carrot tomorrow! The best! Really cool to hear, I should try eating it with celery! really easy and it tastes delicious. The livers were not overpowering which was nice. I would never have thought to add mushrooms. I made this dairy free by using a dairy free spread and it worked well. Thanks for the recipe.